As Yair Lapid looks to form center-left coalition to oust Netanyahu, ex-IDF chief of staff reportedly rejects offer over haredi opposition. While former Finance Minister Yair Lapid’s Yesh Atid party and the smaller Hatnuah faction appear to be in talks towards forming a joint list for this year’s Knesset elections, hopes for a larger center-left alliance to topple Premier Binyamin Netanyahu have been dashed, according to a report Sunday evening, due to haredi opposition. According to a report by Behadrei Haredim, former IDF Chief of Staff Benny Gantz has rejected overtures from Yesh Atid Chairman Yair Lapid for Gantz, the founder of the new Hosen Yisrael (Israel Resilience) party, to join with Yesh Atid and form a single unified bloc of the center-left, in part due to the refusal of haredi lawmakers to join a coalition which includes Lapid. The report suggests that Gantz’s recent rejection of Lapid’s efforts to form a united bloc is due partially to concerns that such an alliance would impair the former chief of staff’s ability to join a new Netanyahu coalition, should the Likud win the upcoming election this April. Haredi lawmakers, including United Torah Judaism chief and Deputy Health Minister Yaakov Litzman, have said repeatedly that they would be unwilling to join any coalition which includes Yesh Atid, in part over Yesh Atid’s staunch support for limiting draft exemptions to yeshiva students. That refusal to sit with Lapid in a coalition, coupled with the combined electoral power of the two haredi factions, would make it difficult for Netanyahu to form a new coalition with Yesh Atid, Gantz fears, sources close to the talks between Gantz and Lapid said. Were Gantz joined in an alliance with Lapid, he too would effectively be barred from joining the coalition in such a scenario. 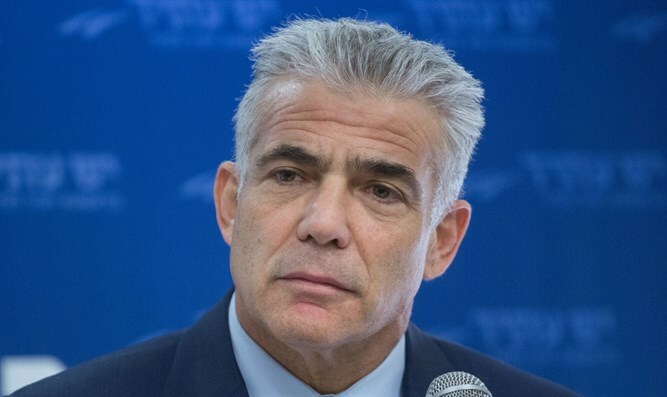 Earlier on Sunday, it was reported that Lapid is also pursuing an alliance with the Hatnuah faction, and met with Hatnuah chief Tzipi Livni on multiple occasions in recent days. Such an alliance, sources within Yesh Atid told Haaretz, would help encourage Gantz to join, Lapid hopes. While Hosen Yisrael turned down Lapid’s offer, the party has reportedly pursued alliances with former Defense Minister Moshe Yaalon’s new Telem party, and Orly Levy’s new Gesher faction.